If you’ve ever tried to write anything, you know the feeling. You have to put words together for whatever project you’re working on and nothing inspiring is coming to your mind. It’s blank… or your thoughts are bouncing off the walls in any direction other than writing what you need to write. You sit and stare at a blank document, maybe typing and deleting a phrase over and over. Eventually you just get frustrated and do something else. 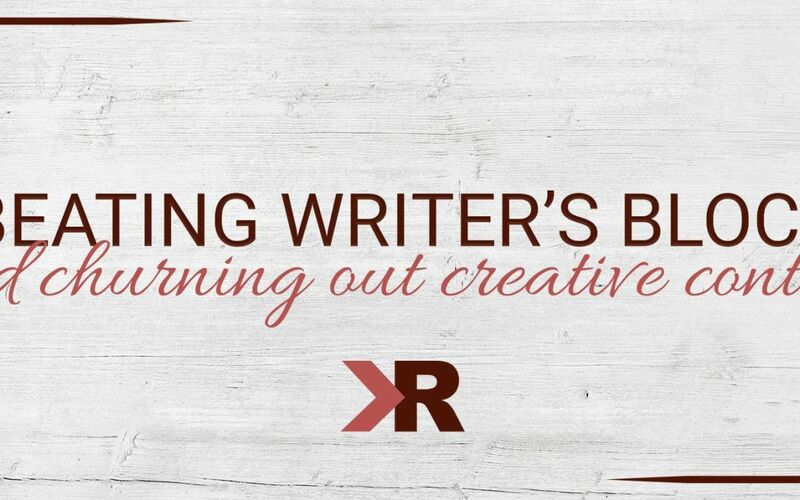 The truth is, everyone who tries to write will experience writer’s block from time to time. The real problem is when you let frustration win and you stop trying. If you’re waiting for the stars to align and every perfectly formed word to descend from the heavens into your fingertips, well, it’s just not going to happen. We recommend every business owner run a blog on their website. This is such an invaluable place to get to know your audience and let them get to know, like, and trust you. Scheduling a time and a place to work. I’ll admit, it is really hard for me to get work done when I haven’t dedicated a time and space to it. My cute dog will try to get my attention, I’ll realize the dishes need doing, and creative workflow is the last thing going on in my head. But when I block out 4-5 hours to spend with my laptop in a cafe or library, I tend to get much more content churned out. Usually I will plan something rewarding for after the work session, which makes the whole process a little more fun. Every once in awhile something majestic happens and it actually does feel like perfectly formed sentences are flowing through your fingertips. When this happens, take full advantage! Don’t stop at one blog post if you’re still in the groove. Maybe the blog post you just wrote reminded you of another possible blog topic. Draft it up! “Mega Batching” is a term we borrow from Amy Porterfield. This is a concept where you come up with a “batch” of blog ideas and pump them all out at once. Then you can draw from the batch down the road and you don’t feel like you constantly have to create content. Looking back on past projects is a great idea for many reasons. Sometimes the reason a writer struggles to produce content is because they don’t believe in themselves at that moment. They feel like they can’t write because there is something wrong with them and their writing ability. It’s good to look back at older, successful blogs (or other projects) to remind yourself you can do it! This will also refresh your memory as to how you wrote the other projects and will trigger the same thought processes. Producing a blog on your website is essential. You’ll face obstacles including writer’s block, but remember to push forward and keep blogging. Test out different locations and times of day to get work done. Keep track of when and where you are most successful. Remember that everyone gets stuck; it’s not just you! Make sure you have all the website essentials in addition to a blog. Download our Website Cheatsheet, which will guide you through building a website that sells. Like KRose Marketing on Facebook where like-minded entrepreneurs gather to share insights, ask questions, and support one another.